You would think being a nurse practitioner and momma to three littles that I'm a huge germaphobe but honestly I'm just not. Maybe it's because I've seen and been exposed to so much (though you would think that would make me worse), but I'm just not one. Never have been, hope I never will be. While I'm not a huge germaphobe I am proactive and try to take all the precautions to try to keep us healthy. With that said I think Addilyn and I have had EVERY single cold this fall except the flu! My kids get ALL their immunizations. including the flu shot...my huge post on that here (disclaimer: I wrote it in 2013 so some facts may have changed). I honestly didn't get the flu shot until about 7 years ago when I was finally forced to, but it is a no brainer for my kiddos. I see healthy kids die from the flu every year so my kids will ALWAYS get it. Even if the shot doesn't get the strand right for the year people who have received the flu shot typically have milder and shorter cases...there are different theories as to why but who knows, I'm just glad it is true, for the most part!! Water + Vitamin C-these are no brainer cold fighters. Vitamin C is the most effective antioxidant in our blood that helps protect our body against free radicals and boosts our immune system. Increased water intake helps remove toxins from our body, carry oxygen to our body's cells, thus helping our immune system. Add some lemon or orange to your water to increase your water intake and Vitamin C.
Hand hygiene-another no brainer-One of the best infection prevention methods is hand washing. I stock up on these wipes and this spray hand sanitizer and keep them with me at all times. Washing your hands, wiping down shopping carts, handles and tables are great ways to help prevent transmission of the flu. Olly multivitamin + probiotic-I recently talked about my love for this multivitamin + probiotic-great immune support and germ fighter. Probiotics help boost our "good bacteria" and strengthen our gut and immune system. Zarbee's Elderberry +Immune support-Elderberry is a plant that has shown to affect the immune system and help fight against viruses including the flu and might help reduce inflammation. I love this Zarbee's immune support that contains real elderberry extract, is packed with Vitamin A, C, D, E and Zinc and contains no artificial colors, flavors, sweeteners, gelatin, alcohol or gluen. 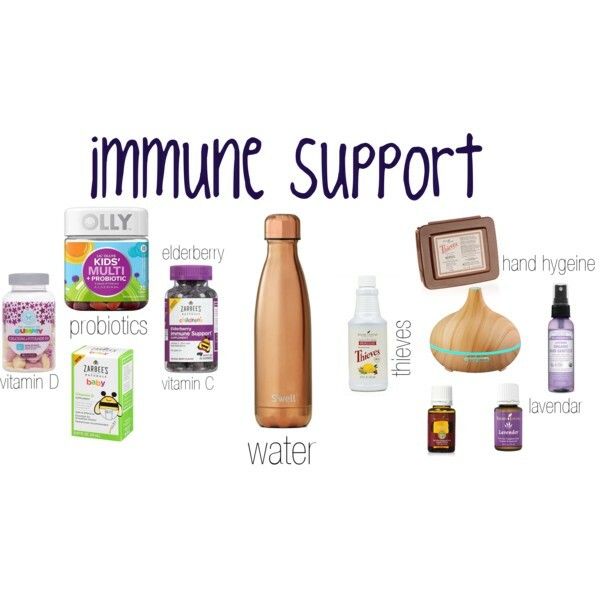 Olly Kid's immunity- Olly's immunity blend contains Wellmube (beta glucans that support immune health, Elderberry, Acerola Cherry and Zinc-all great immune boosters. We grab this or the Zarbee's and always have them on hand. Honest Calcium + Vitamin D3 chewables-There have been so many research studies lately showing the importance of Vitamin D for our immune system and so many people are deficient. Vitamin D helps modulate our innate and adaptive immune responses. Deficiency in Vitamin D is associated with increased susceptibility to infection. My family has been on Vitamin D for several years and I truly see the difference it has made. Thieves essential oil- One of my favorite essential oils to diffuse during the cold season. It is a combination of clove, lemon, cinnamon, eucalyptus radiata, and rosemary. It is know for its irresstibily spicy scent and cleaning power. Lavender essential oil-I have the lavendar essential oil as a roller for the bottom of our feet for sleep, in a spray bottle to spray on pillows and sheets before bed, I use it on my drier balls and a bottle to diffuse. Clearly it's a favorite!! Lavendar hand sanitizer spray- I have a lavendar spray hand sanitizer in every purse, diaper bag and in my car. It is my favorite-all natural, smells amazing and so convenient. Also, Tamiflu is great if you can get it and it doesn't cost an arm and a leg, also remember it's only beneficial if started in the first 24-48 hours of onset of symptoms. If you are unable to get Tamiflu, Oscillococcinum is a great homeopathic treatment for the flu.